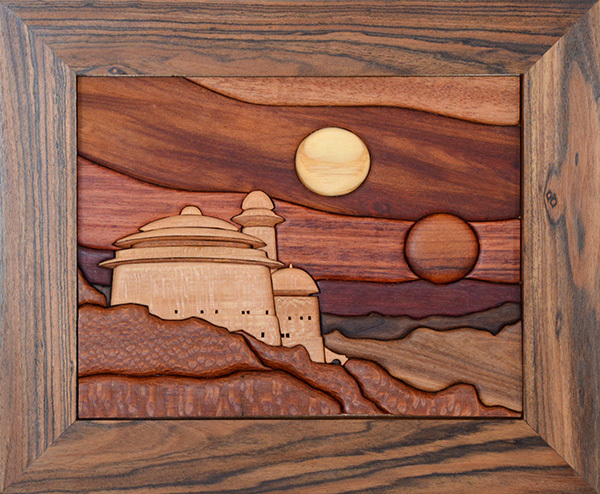 My latest wood intarsia piece: a scene of Jabba’s Palace on Tatooine from “Star Wars VI: Return of the Jedi”. 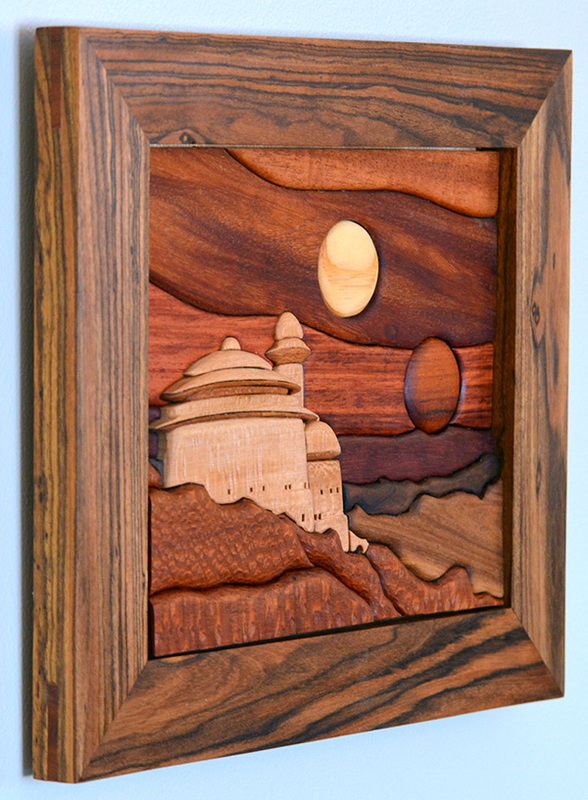 I built this from a variety of domestic and exotic woods including mahogany, bubinga, bloodwood, purpleheart, walnut, lacewood, sycamore, and maple. 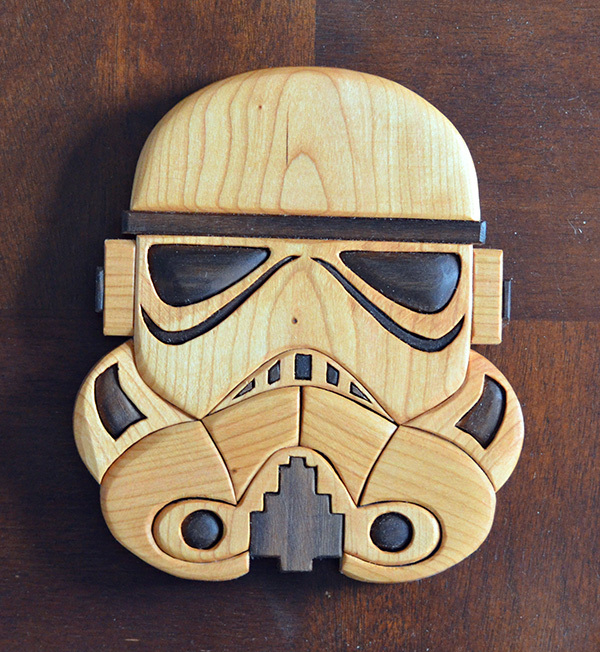 All natural wood colors (NO stains or paints). 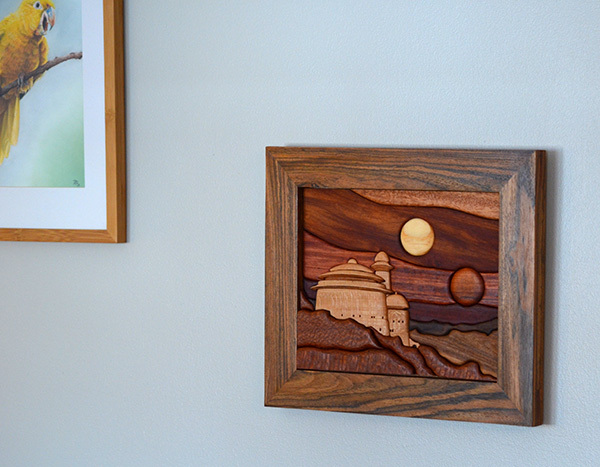 The frame is bocote with mahogany splines. 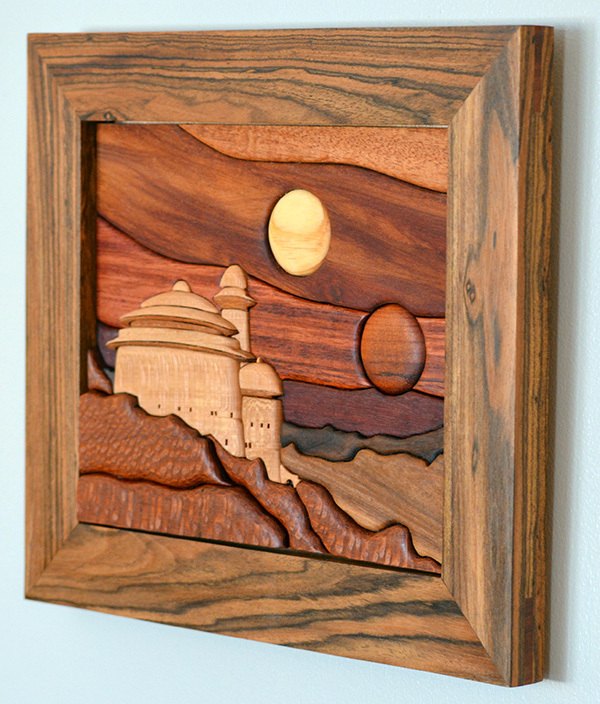 The work is finished with Tung oil and the frame with polyurethane. This work took several weeks (and many countless hours) to create, and I documented the entire process on my Instagram account. Videos can be seen in my “story highlights” on my profile. I made this for myself. However, I am willing to very reluctantly part with it for $500 if someone just had to have it + shipping. You can buy it HERE. 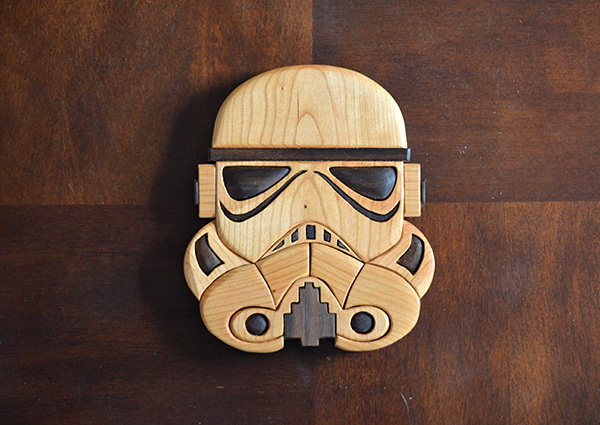 Got some new woods for a new intarsia project! 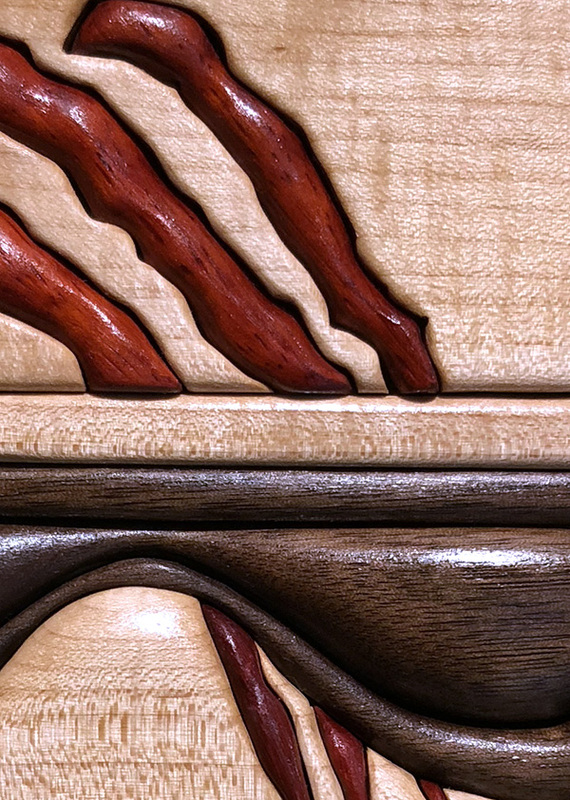 Lacewood, bloodwood, bubinga, sycamore, and maple. 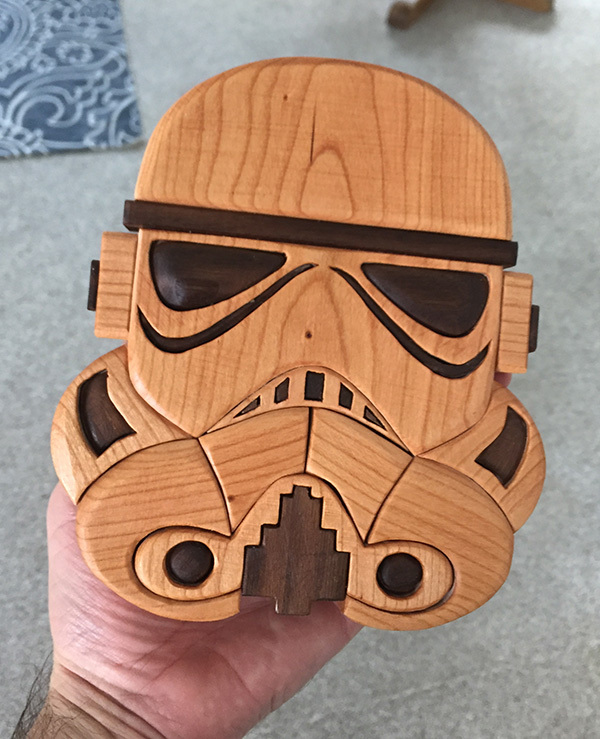 Thanks #ocoochhardwoods! 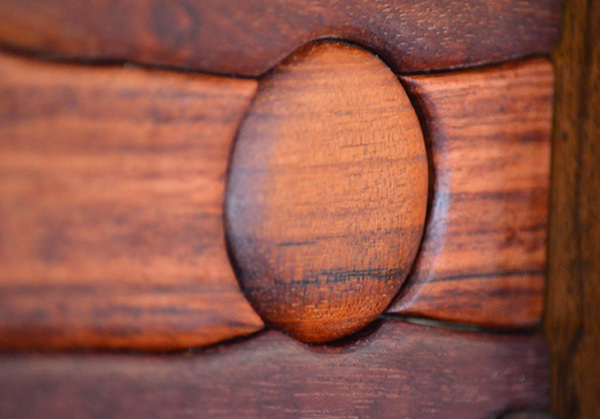 NOTE: this will be the last time I buy bubinga (unless I come across reclaimed scraps), as I just learned that it was recently added to the CITES list of banned species (endangered). 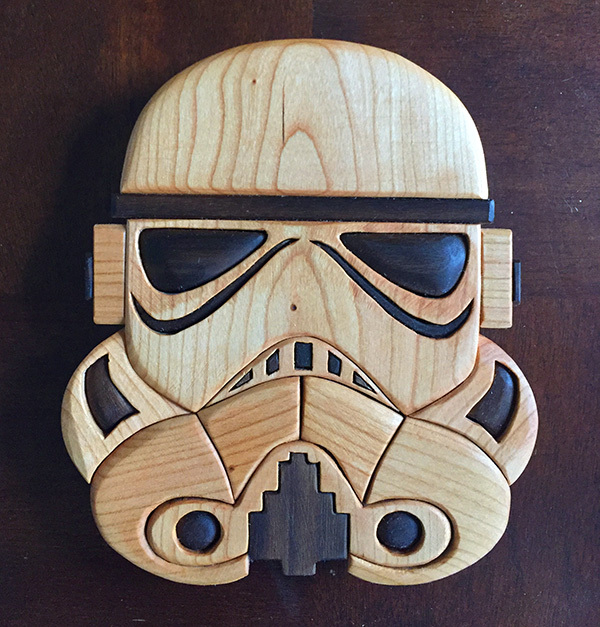 Rockin out to @galacticempireofficial yesterday while starting the cuts for the latest Star Wars intarsia project. These colors after a spritz of water (to raise the grain before a final sanding) are crazy pretty. 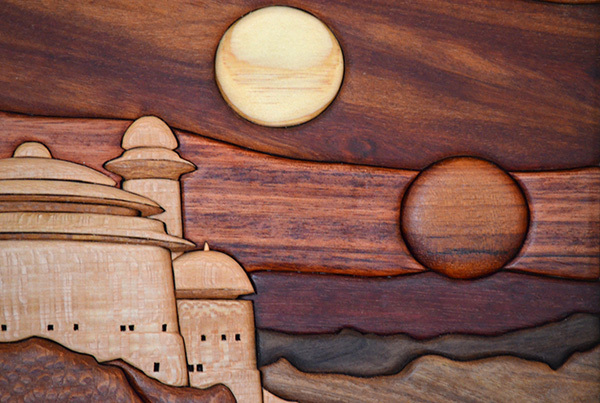 For more on the sanding and spraying, see my stories (archived above under “Jabba’s Palace”). Last shots before the finish (hopefully my Tung Oil will arrive tomorrow. Thanks for all your advice!). I got to break out my 45 degree table saw jig today and rebuild my crappy straight edge jig. 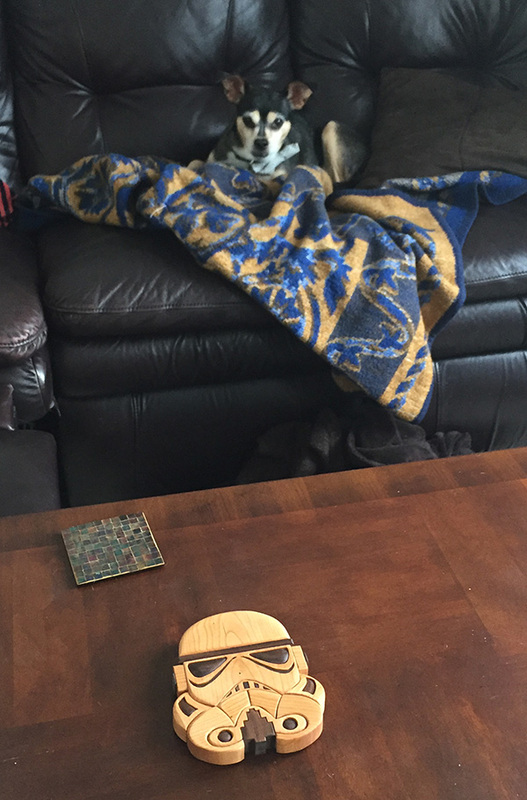 I had a really nice piece of bocote wood I bought a while back for 15$ from @woodcraftofpittsburgh. It was slightly warped, so I jointed it with the straight edge jig, ripped it in half lengthwise, and mitered the 45s to make this frame. It’s not actually glued up yet. 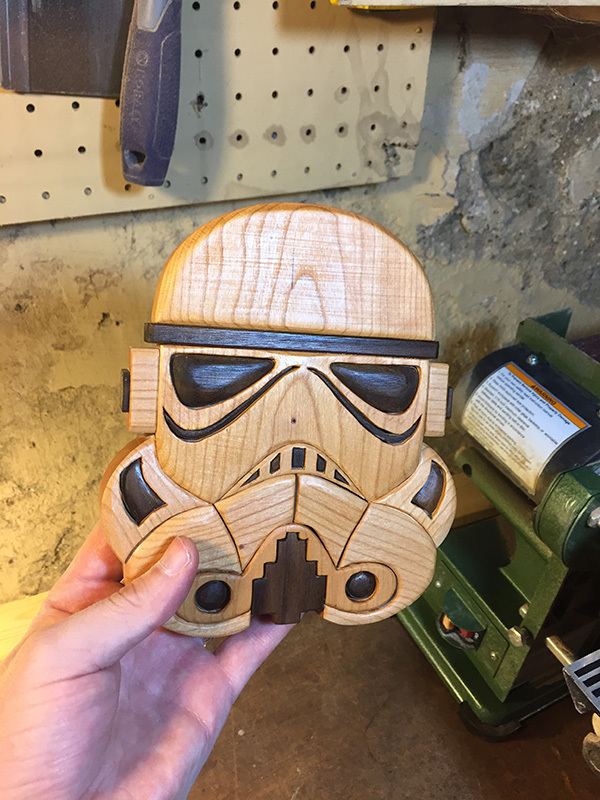 I was originally gonna router the edges, but I love that grain so much I’m just gonna leave it rectilinear – no distractions. I would have paid probably twice that at least for a decent frame otherwise. 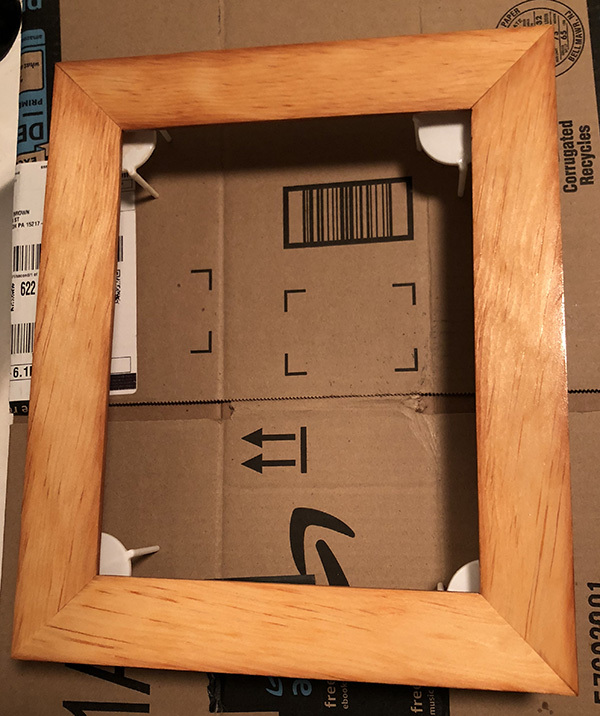 Not that anyone sells frames with these weird dimensions anyway. The piece will intentionally poke out of the frame at its thickest depth. Random: the plywood for my 45 jig was set pieces being thrown away by the Pittsburgh Playbouse. The rest was 50 cent scrap from Construction Junction @cjreuse. Getting all fancy up in here making mahogany splines for the frame by turning my super simple (and shoddy) tenon jig into an equally simple (and shoddy) spline jig. 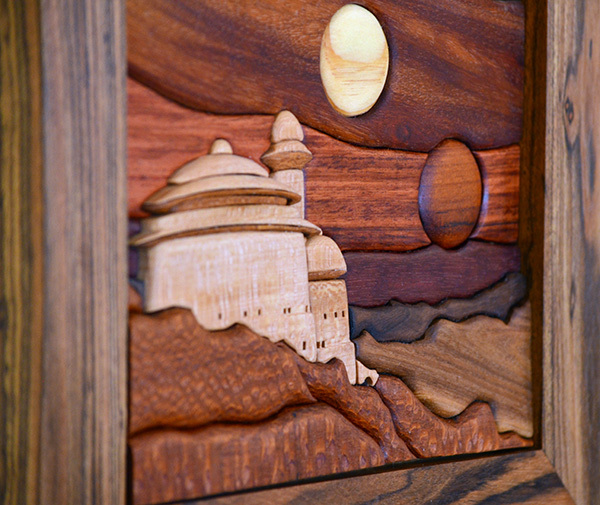 I apparently lied about the last post being the penultimate one on this piece. 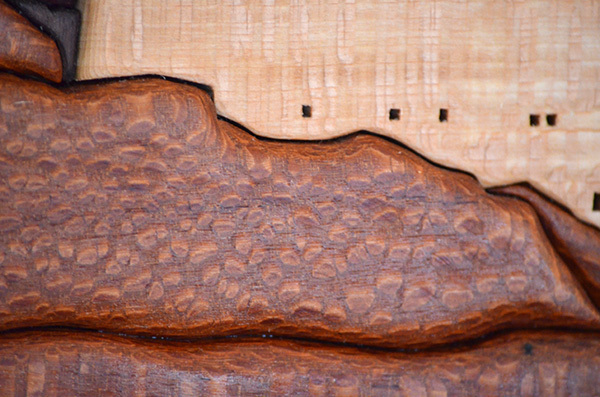 Mahogany spline in some gorgeous bocote. 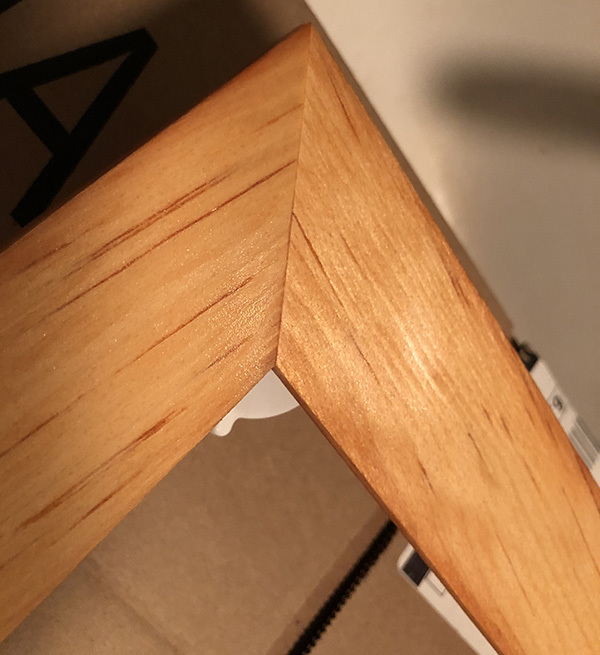 Check out the grain in the second video finishing the frame with @generalfinishes Arm-R-Seal. 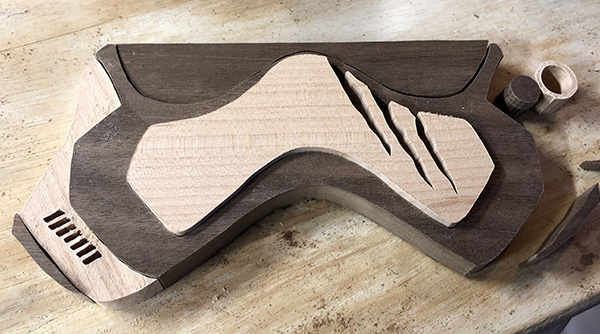 Someday it’d be nice to have those cool bench cookies or varnish stands people use to prop up their work while finishing. In the meantime, the little plastic things that come in pizza boxes work just fine. 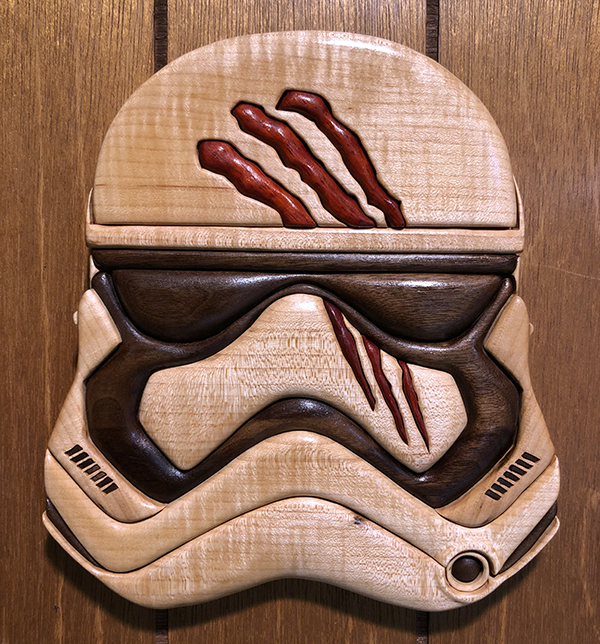 This was a fun wood intarsia project I did inspired by “FN-2187” (Finn) from Star Wars VII: The Force Awakens. 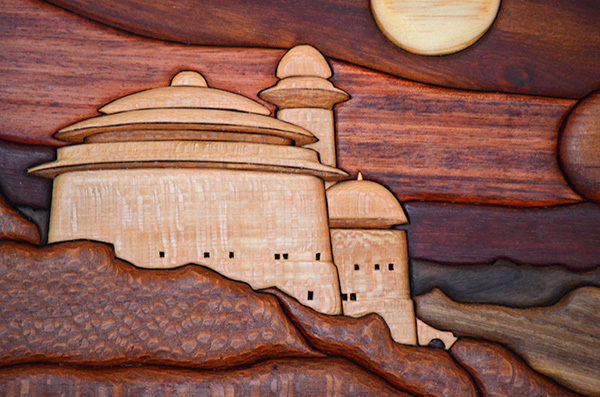 It is constructed with maple, walnut, and padaduk wood – cut with a scrollsaw, shaped with a Dremel, and hand-sanded. 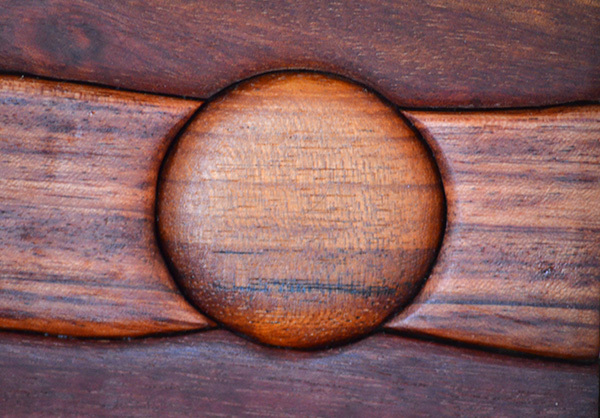 No stains or paints were used – these are all the natural colors of the wood. Finished with gloss polyurethane. I made this primarily for me, but I am willing to sell it. Buy it here. 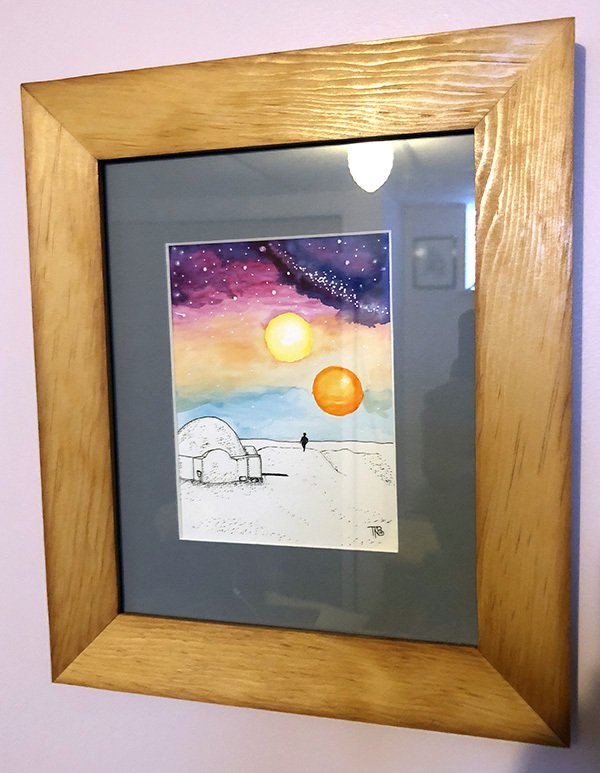 My wife painted me this watercolor and ink scene of Tatooine entitled “Sunset in a Galaxy Far Far Away” so I made this frame for it from unknown wood I found in our garage. My buddy @scrapforge made me a scribing knife. 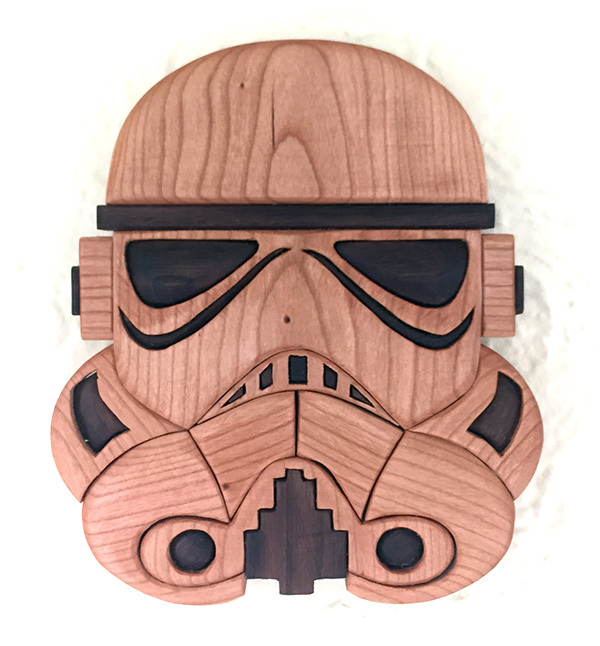 So I made him this from Cherry and Walnut.